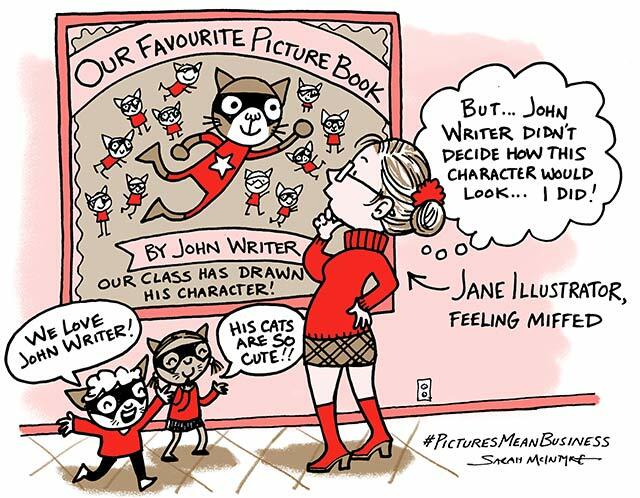 As a young illustrator, I noticed that people who love illustrated books were getting into a bad habit. They were forgetting that every time there were pictures in a book, there was a person who had made those pictures. They'd write an ecstatic blog review, full of pictures, of a book that was mostly pictures and forget to mention the illustrator's name. Writer would tweet the artwork for their book covers and fans would shower the writers with praise about the art as if the writers had made it themselves. An illustrated book would go up for an award and only the writer would get a mention in the listing. Once a teacher proudly tweeted a photo of a bulletin board she'd created with her class, featuring Superkid, my picture book with Claire Freedman. Each kid had drawn their own version of the main character I'd designed, and on the board, they created a version of the front cover I'd spent at least a week painting, but with one big difference... the teacher had included only Claire's name in the display, with mine left off. ...WHY? I wondered. 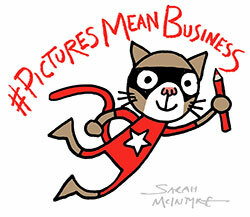 Read my whole article over on the BookTrust Writer-Illustrator in Residence blog! I don't normally comment, but just in case this makes you feel any better: many people, myself included, search for books to buy on Amazon by the illustrator's name, not the author's. Even though you aren't getting that necessary feedback from reviewers there are parents out there who love and value you.